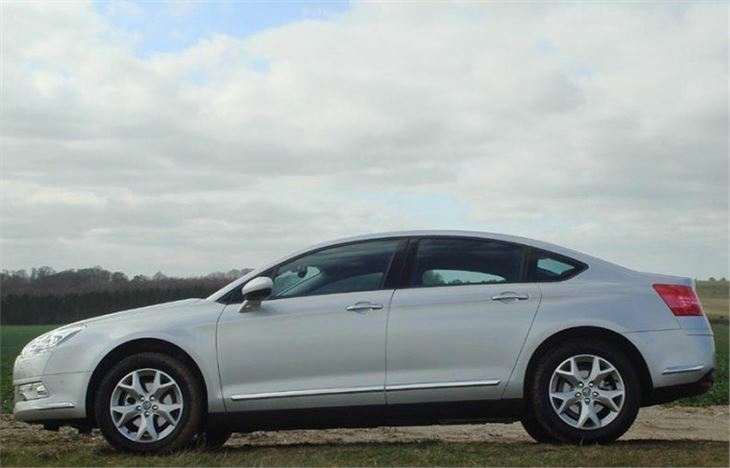 No doubt in my mind, if you showed the 2008 Citroen C5, the Mondeo and the Laguna together, the C5 is the most beautiful car. It photographs well from every angle. It has presence and class. It’s a car you could take pride in owning. It can surprise and delight in practicality as well. 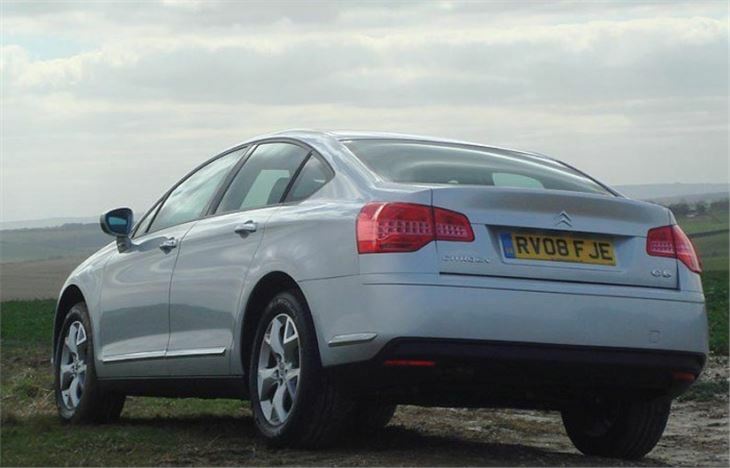 The concave rear window allows the lid of the huge boot to open much wider than usual (it’s a saloon, not a hatchback like the old C5). So you can load it very easily without disjointing your back. (Though please note I did not rain-test it.) Under the boot floor is another nice surprise. 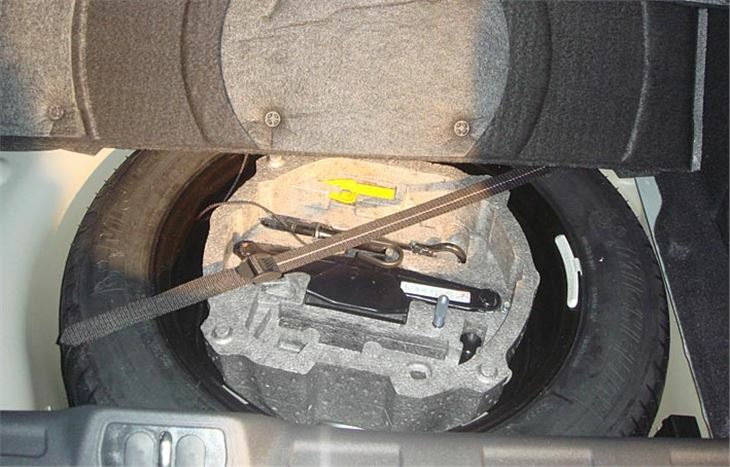 A full-size spare wheel. No ridiculous compressors and squeegees of glop that are as much use on a shredded tyre as a can of hairspray. Get in and you find masses of adjustment for the driver’s seat and steering wheel, allowing any size and shape to be comfortable, particularly the very tall. There is a surprising amount of headroom inside the car for such a low roofline, but that’s because you sit deep, cocooned safely inside. Then the fun starts, or doesn’t, as the case may be. The new C5 comes with three different types of steering, according to model, all with variable assistance according to how fast you are going. The lower powered C5s have purely electric assistance, the mid-range cars electro-hydraulic, and the V6 diesel purely hydraulic. Around town the steering can feel unusually lifeless with a strange king of artificial stickiness and requires a lot of turning. If you habitually keep you hands in the same place on the steering wheel this could get you into trouble. You’re going to have to learn to feed the wheel all over again. Out of town, the steering reactions speed up a bit. You still can’t feel anything, but at least all the C5s grip and handle very well, so as long as you are prepared to trust the car you can make very rapid and very smooth progress. The car comes on two different types of suspension. 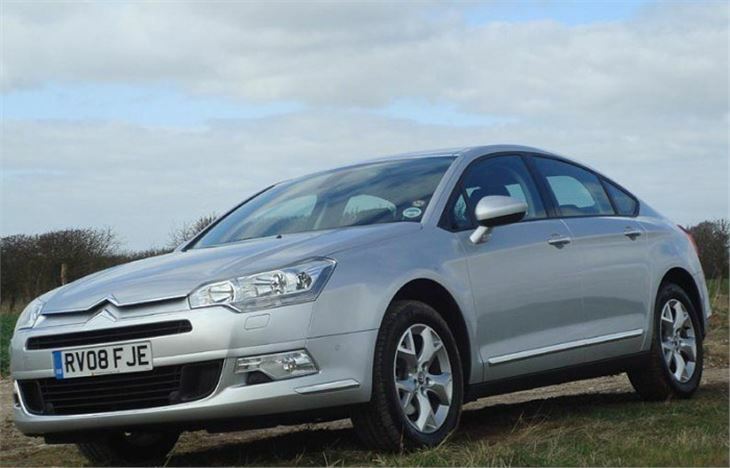 Steel springs or Citroen’s ‘Hydractive 3 Plus’ self-levelling system. All use the front double wishbones and rear multi link arrangement from the C6. First we tried a high spec 2.0HDI 6-speed automatic. In this car, gizmos and gimmicks abound. They include the hyperactive and plain annoying ‘lane departure’ system, a driver’s seat massage, a speedo that displays speed both digitally and by dial, directional and adaptive headlights. 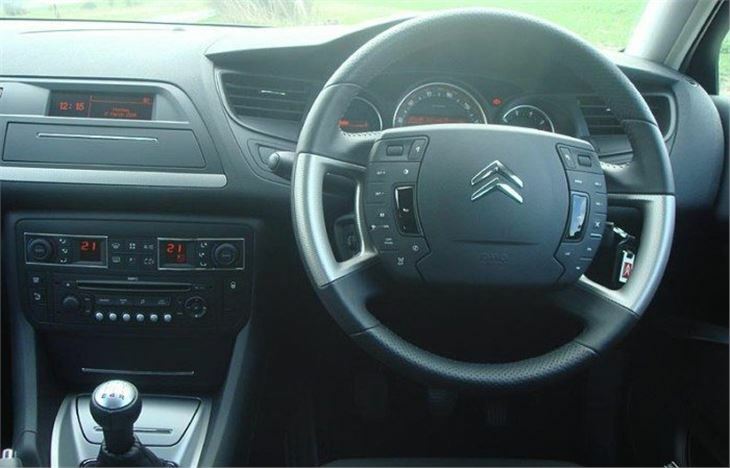 Plus the usual Citroen features of cruise control with speed limiter, fixed centre steering wheel (which allows a more body shaped airbag), ABS, EBD, ESP, all that stuff. The brake assist jumps in very early, so it takes a bit of acclimatisation to drive the car smoothly. 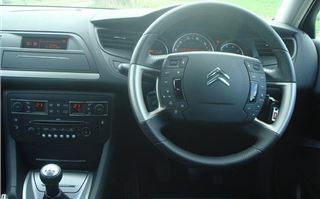 The satnav screen is pleasingly visible in the centre of the dash. 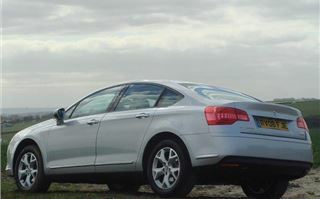 The suspension can be re-set to Sport mode, but you don’t notice much difference because it reacts anyway to the style in which the car is being driven. Just in Sport mode it tightens up a little earlier and works on fast sweeping bends as well as on tighter cornering. It doesn’t completely absorb every rut, pot-hole and draincover, but gets closer to this than any other car in its price range. Next we demoted ourselves to a 2.0 litre petrol VTR+ on steel springs. This still absorbed bumps very well with a little less wallow, but the same variable quality steering. 5th was geared at a sensible 22.5mph per 1,000rpm. 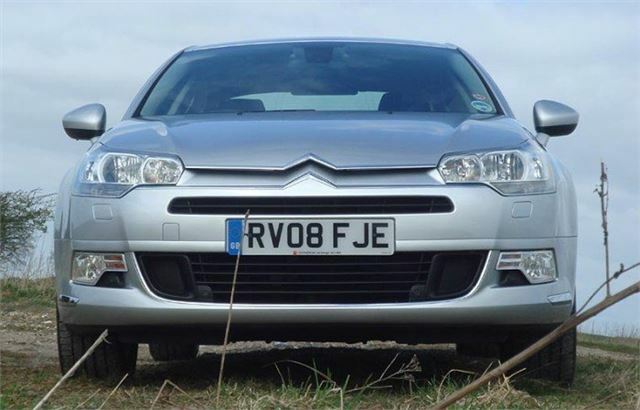 Lastly, the most important car in the range: the 1.6HDI. Most important because it’s the most economical and it and the 2.0HDI manual are the only cars in the range under 160g/km. This will be critical from April 2009 onwards because a company buying anything over 160g/km will only be able to write down 10% of the cost against tax per year. That means it will be losing more money in depreciation than it can write down against tax, so no company with an eye on its costs going to buy cars emitting 160g/km or more unless they are for the bosses. And even then it may make more sense for the bosses to take the money as salary and buy their cars themselves. The 110PS 1.6HDI struggles a bit to haul the C5’s 1,503kg kerb weight along. This is no lightweight like the new Mazda 6 at 1,280 – 1,320kg. 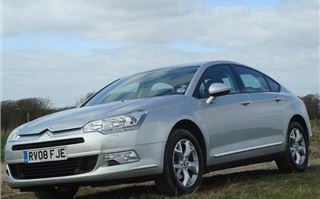 Citroen has even lowered the final drive to 27.5mph per 1,000rpm in 5th to help thing along. But once you get going you can make respectable progress and the aerodynamics might deliver the promised 50.6mpg combined. Actually most new C5s are slower to 60 than the old models, by as much as two seconds, due to the increased weight. Though they still pull similar top speed and offer similar economy perhaps because of the improved aerodynamics. But will you choose one over the lighter weight opposition, in particular over the Mazda 6 or Ford Mondeo? 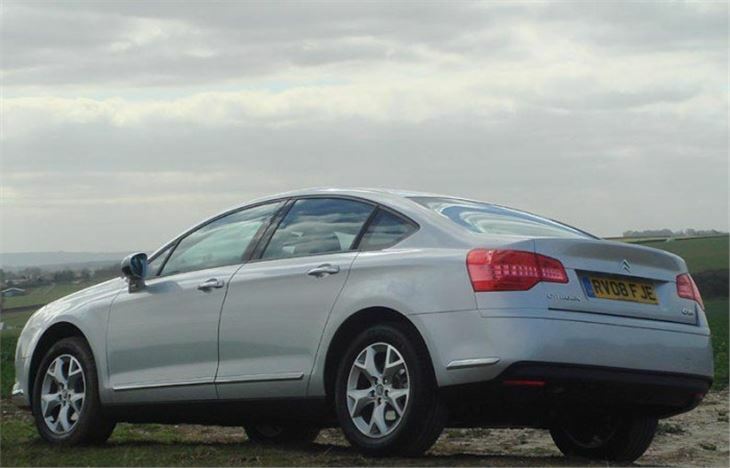 The new C5 definitely has it over the Mondeo in the looks department, and maybe over the Mazda 6 too. But while it gets on with the job very smoothly it doesn’t drive and particularly doesn’t steer as enjoyably as either of these two worthy opponents. If you put beauty and sophistication over fun to be with, then, as in some marriages, the C5 may be for you.